These fish have a wide distribution, with most hailing from Africa and the New World, and a few from Asia. Cichlids need varying water conditions, depending on type, so check carefully on this before buying. For example, cichlids from Lake Malawi, in the Rift Valley area of east Africa, require hard water; using coral gravel helps maintain the right water conditions, especially if you live in an area with soft tap water. Cichlids from Central and South America generally require soft water, in common with other fish from this region. Although small cichlids may appear quite docile, bear in mind that they usually grow fast, then tend to prey on smaller companions. Oscars (Astronotus ocellatus) are typical in this respect, although these fish are popular because they can readily be tamed. With their elegant shape and beautiful markings, angelfish (Pterophyllum species) are much loved, but they are also not suitable for an average community aquarium. They grow rapidly, tending to outstrip their companions, and their trailing fins are often nibbled. Most popular are the angelfish itself (P. scalare) and the less common deep angelfish (P. altuni), with its distinctive depression in front of the eyes. There are various colour forms, including an attractive yellow and silver variety. Angelfish may be kept in shoals at first, but for breeding purposes, house pairs on their own. Increase the amount of live food in their diet to trigger breeding behaviour. They will sometimes breed in an aquarium, often using a piece of slate for spawning purposes. Like many cichlids, angelfish show a degree of parental care, guarding their eggs until the fry hatch. The development of new colours has focused most strongly on the discus (Symphysodon discus); these have established a dedicated following, with rare colours in particular fetching large sums. This is partly because discus are sensitive fish, with highly specific needs in terms of conditions. They require soft, slightly alkaline, well-filtered water, but provided this need is met, they are not difficult fish to look after. Breeding may be disappointing, particularly with young fish, which may well eat their eggs, but they should spawn again before long, usually with greater success. If buying young discus, remember that they may take up to nine months to attain their full coloration. For angelfish, such as this deep type (Pterophyllum altum), provide a deep aquarium, with plenty of upright vegetation so they can weave in and out of plants as they do in the wild. 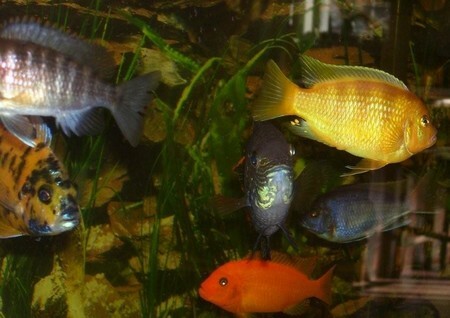 Many of these cichlids should be kept on their own, because the males often become large and aggressive. As they come into spawning condition, males may persecute females ferociously, so it may be necessary to separate them for a period to prevent injury. Larger cichlids, such as the firemouth (C. meeki) and the pugnacious Jack Dempsey (C. octofasciatum) – justly named after the famous boxer – are also prone to uprooting plants and even biting at the heaterstat; use an external type of heater for these fish as they mature. One reason these fish cause such an upheaval is their habit of creating spawning pits in the substrate. The eggs are laid on rockwork and, after hatching, the fry are shepherded into these pits, where they are guarded by the adults during the critical early days of life. Few fish are more devoted parents than the mouth-brooding cichlids from the Rift Valley lakes in Africa, such as the zebra Malawi cichlid (Pseudotropheus zebra). After spawning, the female collects the eggs in her mouth and keeps them there for roughly three weeks, without feeding herself, until the young hatch. They will remain close to her, darting back into her mouth if danger threatens, for a further week or so. Many of the Rift Valley cichlids vary widely in appearance, which makes pairing difficult at times. 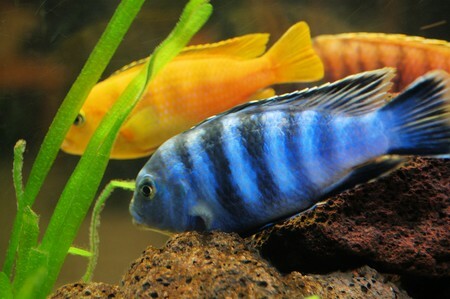 For example, most zebra Malawi cichlids are light blue with dark stripes, but there is also an orange form with black blotches; most of the latter type are apparently female. Sexing is relatively important with these cichlids, because males are naturally territorial, and so several females are best accommodated with a single male. Some are monogamous, however, such as the stunning lemon cichlid (Lamprotogus leleapi) from Lake Tanganyika. Keep pairs apart from others of their own kind, as they will prove to be aggressive.